Reading Cafe: The Perfect Cure For Summer Time Blues - Try This! The Perfect Cure For Summer Time Blues - Try This! Summer time blues? Why should anyone have blues during the summer is beyond my scope of understanding. Hey, come on now, isn't it the time of the year when everybody (and I mean everybody) is on vacations. Clear blue skies, perfect weather for some real cool and fun activities for the whole family, young and old. So what if you haven't been able to muster enough money to book that perfect holiday to the Bahamas, Caribbean cruise, or even Hawaii? Hey, perk up guys, I know just the perfect activity to cure the summer blues away. All you need is a "backyard inflatable pool", and see what fun it can be. It won't cost you much either. You can get some cheap inflatable pools too. What if you don't have a "backyard"? Well, that's a very valid question, as most people living in the city do so in flats and space is generally a very "luxurious" commodity to have there as is so much water to be able to fill a pool! So, not to worry or fret, just go to the nearest community "swimming pool" and I am sure you can have just the same, if not more, amount of fun. Playing in the swimming pool can also be lots of fun, if you take a handball and play with it in the pool. Or just take an inflatable bed and lie there reading a book or sipping some cool refreshing drink. The other option is to go to a nearby "Water Amusement Park" with your family and spend the whole day there splashing about in the water and trying all the fun rides and slides. The only disadvantage of this activity is that you can't go everyday! 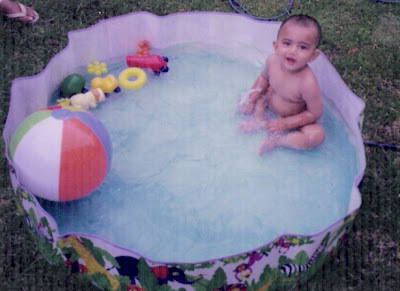 So, I still say that the "backyard pool" is the best bet. I hope you are off to buy the pool and all geared up for some real fun and games in your backyard. I call that "Rummy!" (Pardon the expression, I am reading a lot of PG Wodehouse)! Visit The Shopping Arcade to buy some more fun games and toys.